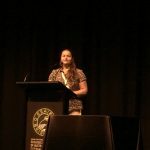 The Project Coordination Team was invited by one of the grant recipient of the MbZ Fund to give a presentation about the project at the symposium “Challenge: How to investigate long-lived organisms within 3-year funding cycles?”, part of the 2018 Annual Conference of the Ecological Society of Australia. 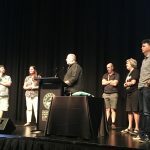 The conference took place in Brisbane on 25-28 November, 2019. 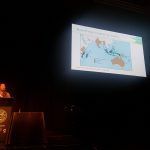 Chrsitina Shaw, CEO of VESS, implementing VU1 and VU2 presented the talk and Alec Hughes, CEO, Coastal Marine Management, attended as a guest of the Dugong and Seagrass Conservation Project. The session was focused on understanding the ecology of long-lived organisms in short funding cycles. Dugongs can live to be 70 years old. Long-lived species are threatened by declines in population that maybe masked by their longevity. Threats to long-lived organisms must be mitigated within the span of only a few generations. Furthermore, most funding cycles are short-term, often limited to 3 years, and present logistical constraints on understanding the ecology and management of long-lived species. 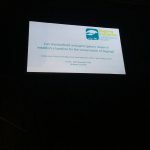 There is thus an urgent need to develop a new toolbox of ecological research methods: those that can effectively answer long-term ecological questions within very short time-frames. The objective of this symposium is to synthesize a range of non-traditional research methods for effectively studying long-lived species and engage attendees to evaluate their potential effectiveness. The 2018 Conference theme was Ecology in the Anthropocene, reflecting the era of great tribulation and yet great opportunity in which we live. Working out how people and nature can coexist on planet Earth is surely the grandest of all society’s challenges, and at the conference we will explore how natural ecosystems function, how human activity has impacted them, and what can be done to reverse the biodiversity crisis. This news article relates to the project entitled Improving policies for dugongs and seagrasses in Vanuatu through research and awareness raising (VU1).. Click below to learn more about this project.